Auxin is among the key growth regulators that play diverse roles in virtually all aspects of plant growth and development. Intensive investigations during the past two decades have helped in elucidation of auxin perception and signal transduction mechanisms operative in plants. In addition to its primary role in regulating plant development, several studies in recent years have provided unflinching evidence for the involvement of auxin in abiotic stress responses. Functional genomics studies and genome-wide expression analysis have revealed altered expression of auxin-responsive genes, such as Aux/IAA, GH3, SAURs, and ARFs, under abiotic stress conditions. Variations in endogenous levels of auxin at global and local levels under various abiotic stress conditions have been associated with phenotypic changes and provided intriguing evidences regarding its role in response to environmental changes. Modulation of reactive oxygen species (ROS) levels in response to exogenous auxin as well as to drought, salinity, and ABA have indicated towards a complex relationship network between auxin, ROS, and abiotic stresses in plants. The advent of recent functional genomics technologies has led to identification of several candidate genes that may modulate crosstalk between auxin and abiotic stresses. 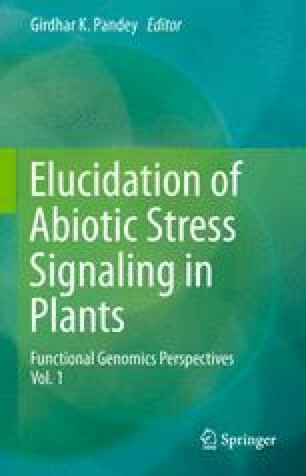 This chapter discusses auxin homeostasis, signal transduction mechanisms, and how these processes are modulated under abiotic stresses, thus emphasizing on the emerging roles of auxin as a key integrator of abiotic stress pathways and plant development. We acknowledge the financial support provided by the Department of Biotechnology, Government of India (J.P.K. and M.J.) and Indian Council of Agricultural Research (J.P.K.) for conducting research in respective laboratories. M.J. also acknowledges the in-house financial support given by the National Institute of Plant Genome Research. E.S. thanks the Council of Scientific and Industrial Research (CSIR), New Delhi, for the award of a Research Fellowship. J.P.K. also thanks the University Grants Commission, New Delhi, for providing infrastructural support.